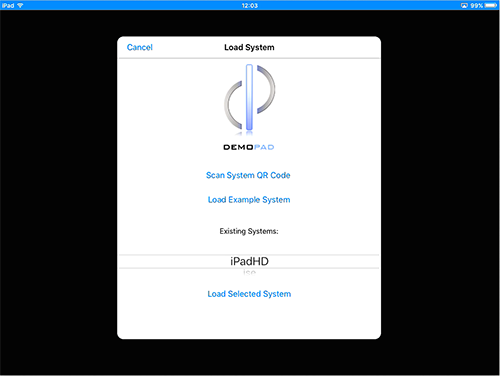 Once you have created your DemoPad project with our DemoDesign software, you need to deploy it to end user devices running iOS. Download the free CentroControl app from iTunes and launch it on the device - you will be presented with an option to load an example system, or to scan a system QR code - you simply need to scan the QR code generated by the designer software which will download the project to your iOS device, where it then resides. Deployment can be done either locally, using a QR code linked to your development computer on the same network, or via our cloud system, where deployment is dealt with through our cloud servers. One major advantage of using our cloud servers for deployment is that changes made to the project on your development computer can be automatically synchronised with end user devices, saving the need for site visits to make changes. 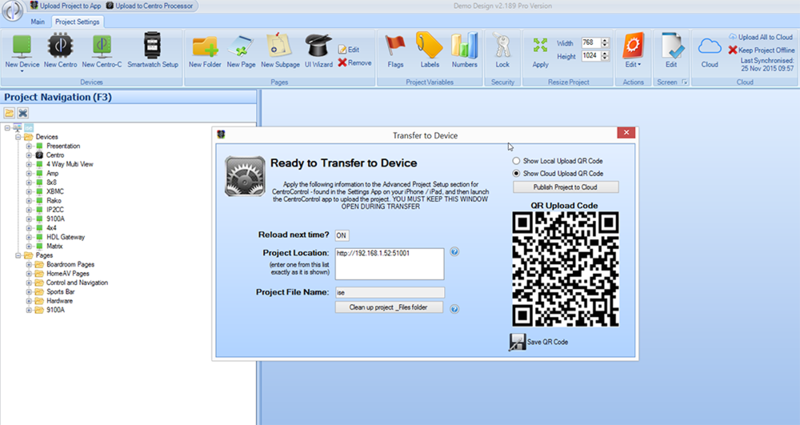 Once a project has been downloaded, it is possible to download further projects to the device by navigating to the Settings app on your iOS device, choosing CentroControl - Project Setup and either entering the project location details manually, or enabling the QR Code Screen option for the next time the app is launched, where you can then scan another QR code.